Rye On Rye X: Sazerac Cocktail | Boulevard Brewing Co.
For the second Rye-on-Rye X release, we drew inspiration from the famous New Orleans cocktail, the Sazerac. The official recipe is composed of rye whiskey, absinthe or Herbsaint, a sugar cube and bitters all garnished with a lemon peel. To translate this classic cocktail into a beer, we brewed batches of the base rye beer that received spice additions mimicking bitters as well as lemon peel during the boil. The resulting wort was fermented with our house Scottish ale yeast before being aged in freshly emptied Templeton Rye barrels. Poured into a wide stemless wine glass: color is light amber, head is off white with fine bubbles - really looks like a mixed whiskey drink with some carbonation. Smell is rye whiskey, light malt, limited booziness, some citrus pith and bitter spice. Quite aromatic and enticing, might be the highlight of this experience. Taste evolves from start to finish and from cool to warm, great flavors present with malt originating notes of caramel, fig, toffee, brown sugar; evolving notes of spice and bitter lemon; then deepening flavors of herbs, vanilla, and whiskey based flavors. Mouthfeel is full, sweet, bitter, and then drying. Really has the presence of a whiskey drink with just a hint of carbonation I really think the extended aging smooths out this type of presentation. Overall this is an excellent concept and well executed. Really creates the presentation and flavor of a slightly bitter whiskey drink. Pours a murky dark amber/mahogany color with khaki head leaving foamy lacing. About a month past the best by date. Nose is rich wood, spice and toasty malt with a bit of booze. Taste follows with more boozy barrel ,spice and malt. Similar to a Belgian dubbel . Finishes with an almost creamy feel and a definite bit of alcohol creep. Really tasty. A bottle aged until a smidge past its BBD in June 2018, now July 2018. Cork pops out with a nice carb to it. Pours a copy of a belgian dubbel, a dark mahogany red with a good amount of carb still in it. The aroma is at first sweet, not overly so, rye and a tinge of alcohol cutting through. Well and truly a Sazerac in there. Taste is again, similar to a dubbel in that the malt is on top and dominant to start but relinquishes to the rye, sweet, boozy bits as well that were behind it. Again, a great imitation of the cocktail overall that I quite liked. Whiskey isn't overly in your face and I'm not sure if that was the aging or if it was always subdued. A - Pours a dark reddish brown with a two finger off white creamy head. Heavy soapy lacing. S - Aroma is caramel, rye and light whiskey. T - The taste is caramel, toffee, candied lemon peel, spicey rye, whiskey and oak. M - Medium body with low carbonation carbonation. Creamy mouthfeel with a soft dry finish. O - This is a nice Rye on Rye variant. Taste is like a mellow sazerac cocktail. This one pours a dark-ish brown, with a very small head and basically no lacing. This one smells like caramel, booze, rye whiskey, spice, citrus, and oak. This is pretty tasty. There’s lots of barrel, with a subtle booziness, and a mild spice and citrus character. There’s lots of oak, caramel, toasted bread, and toffee too. This is medium bodied, clean and creamy, with a lower level of carbonation. This is a nice variant on Rye on Rye- but I think the regular version is better. The pour reveals a cloudy dark copper colored beer with a rich tan head. The rye is present on the nose, as is the caramalt - and a wallop of booze. The taste is malt-forward, with the caramalt blending well with the subtle spice of the rye. The barrel adds a significant booze component, to the point that this does indeed resemble a beer martini. Nicely done by one of my favorite breweries. Attractive dark brown with garnet highlights. Head production is moderate, with simply OK retention. Brew is surprisingly malt forward, with the whiskey providing a wonderful second half to the aroma. Rye, spices, and toffee; whiskey and oak; dulled brown sugar and dark fruit. Flavor follows, with a touch of sweetness not particularly present on the aroma. The rye (whiskey or malt) provides a really pleasant second half bite. Between the lemon peel and the spices, they really nailed the flavor of a cocktail (although I'm unfamiliar with this particular cocktail), mostly on the second half. Fresh and minty on the finish, too. Up front, dry and grainy caramel malt prevails. Lively and pretty smooth, not unlike a carbonated cocktail, actually. Long finish. A very enjoyable and completely unique brew. 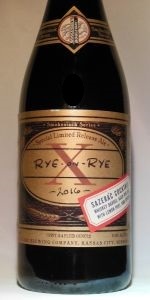 Rye On Rye X: Sazerac Cocktail from Boulevard Brewing Co.